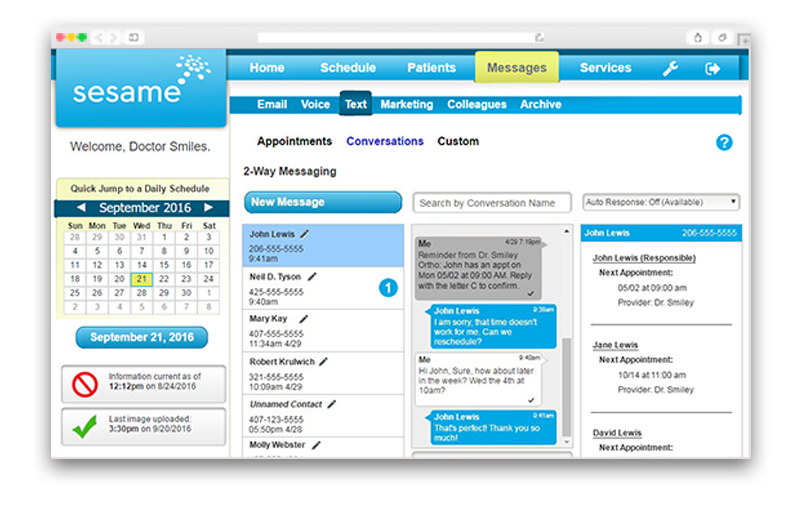 Designed exclusively for dentistry, our patient-engagement tools give your practice a powerful, HIPAA-compliant patient communication solution to improve the experience of both your patients and your team. The success of your dental practice depends on keeping a full, efficient schedule. Good organization and communication enables you to provide your patients with the one-on-one attention they deserve. 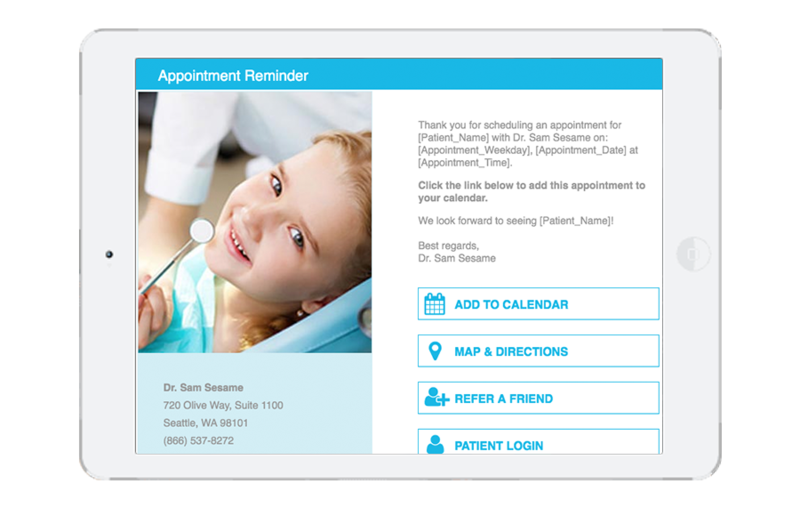 Our automated appointment reminders allow patients to customize how they receive dental appointment reminders and communication from your office with email, text messaging, and/or voicemail. Patients can also download a digital calendar reminder, significantly reducing no-show appointments. 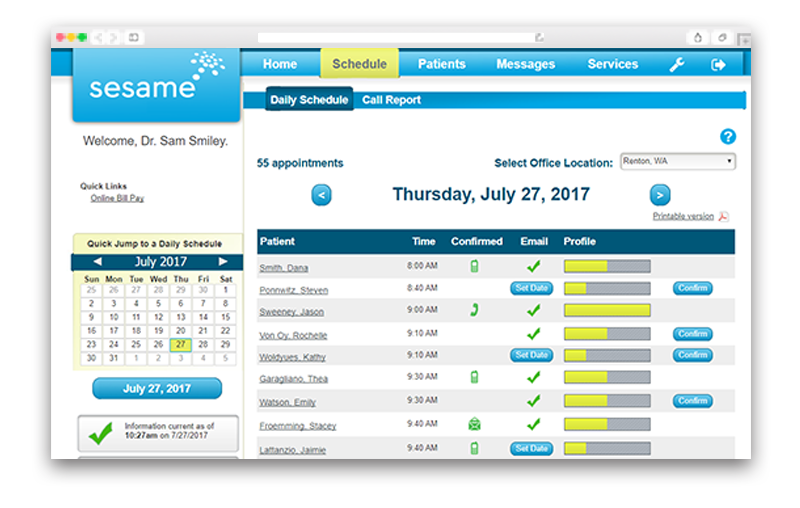 If patients do miss appointments, you’ll be able to notify them with automatic reminders to reschedule. Conduct conversations with your patients within our two-way text-messaging dashboard. When a patient texts your office number, you will receive a notification of the new message in your dashboard, and be able to respond to the patient directly. Our Secure Messaging allows your practice to collaborate securely with specialists and colleagues without the need of additional software. As our member, you can use your practice’s colleague and patient lists as an address book and send messages to them, even if they are not Smile Savvy members. In addition to sending text, you can also attach files and images manually or select patient images from your compatible imaging system. Our Secure Messaging works like email, but uses a secure, HIPAA-compliant mailbox to share messages. This allows patient PHI to be encrypted every step of the way. Patients will be able to use your Patient Portal to pay bills and view appointments online, access their online health history forms, view their diagnostic images and X-rays, and save and print ledger statements for their personal financial records. This feature also allows them to refer friends and family to your practice and provide post-appointment feedback about their visit, all from one easy-to-use dashboard. Reduce outstanding balances by sending automatic email financial reminders with convenient online bill-pay options. 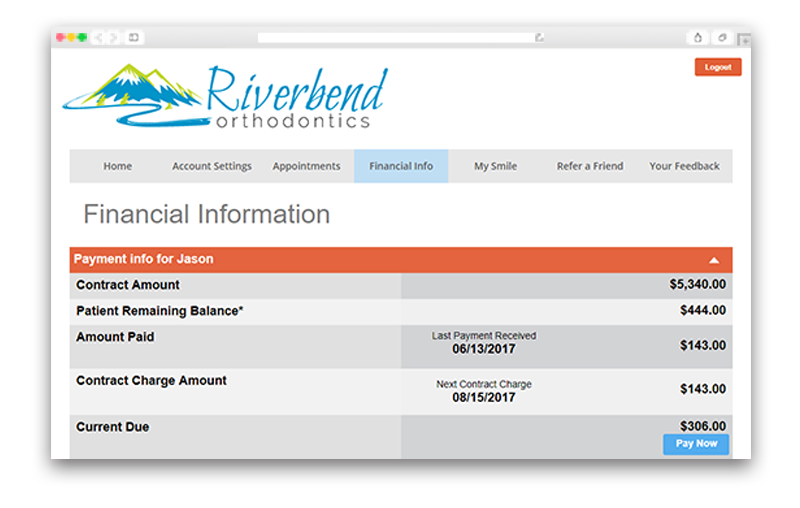 Patients can simply log into their account profile and review and pay their bills online directly through your website. Your patients’ credit card information and payments are encrypted the moment they enter it in the secure server via SSL (Secure Sockets Layer). 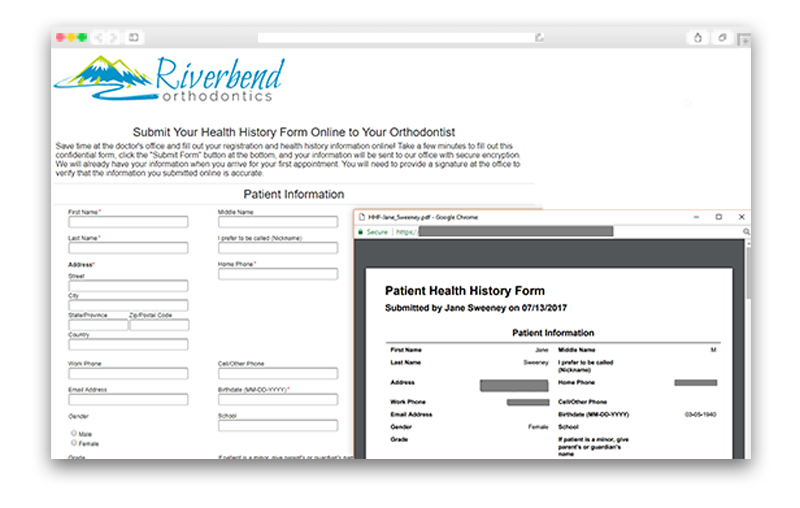 Our Online Health History Forms make registering new patients or collecting information about previous medical histories easy. 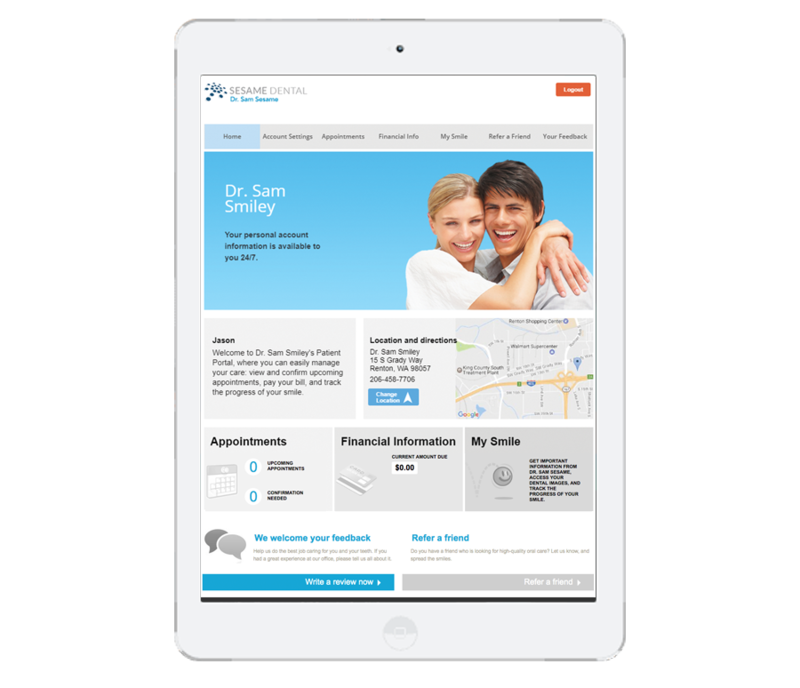 The forms are simple, secure, and HIPAA compliant, so patients can trust that their information is safe. Online Health History Forms are a great way for new patients to provide necessary information, all from the comfort and convenience of their own homes. Our scheduling system is an easy way for you to review the day’s appointment schedule, including confirmations and cancellations, with a calendar interface designed with your front office staff’s efficiency in mind. 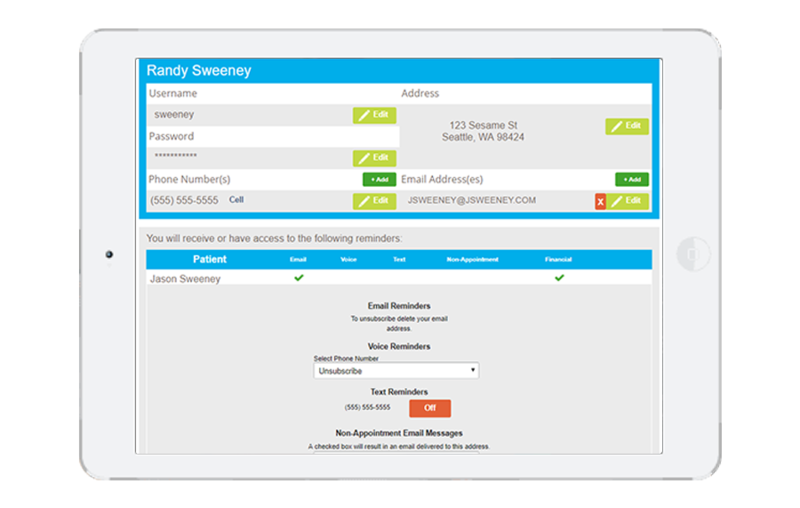 The scheduling system also has the ability to send automated email/text appointment reminders, with the added convenience of viewing patients’ appointment and payment history, and their scheduled future appointments, all in one place. 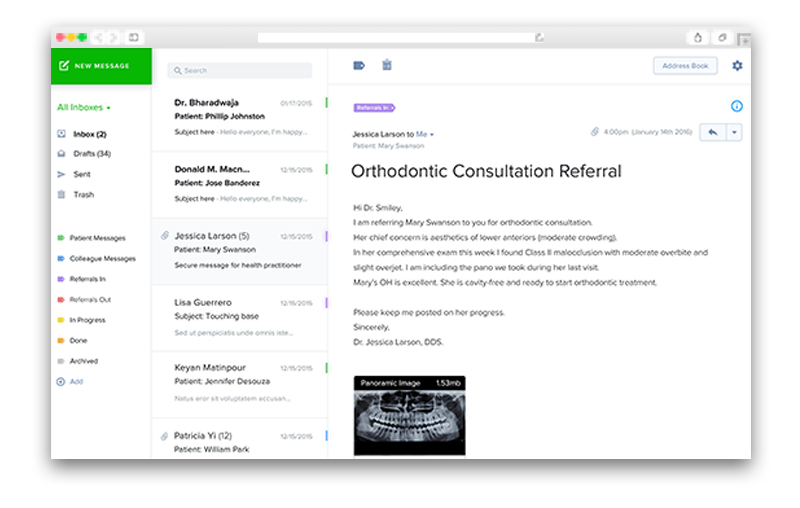 Our easy-to-use communication tools make sending dental appointment reminders, customized digital newsletters, group messages (email blasts), patient referral requests, satisfaction surveys, and even holiday and birthday greetings as simple as possible. Communicating with patients outside of traditional office communication is a versatile way to encourage patient engagement. 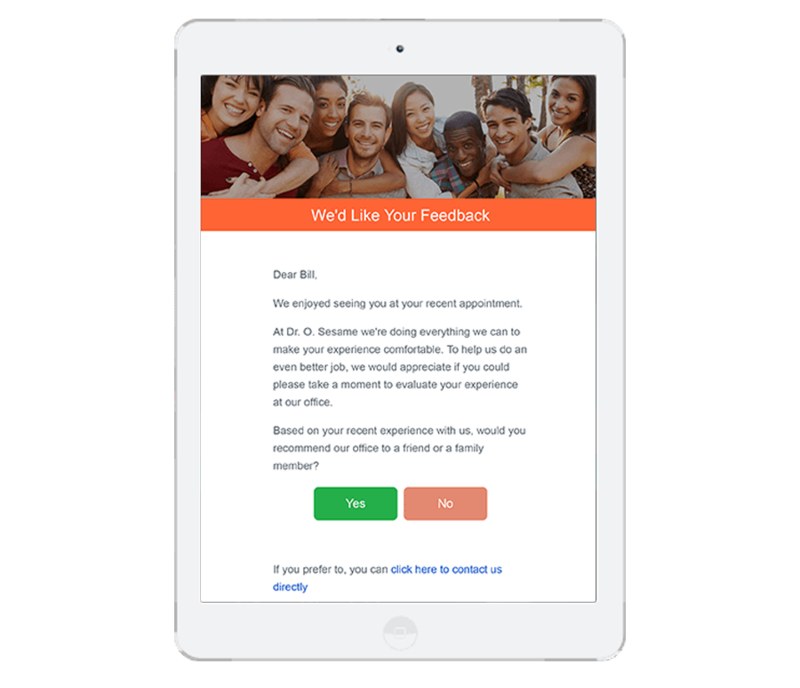 Send post-appointment text messages to your patients asking for their feedback with our Smart Feedback feature. Patients with Gmail addresses will be redirected automatically to Google to post a review.